A boiler is a closed vessel in which water or other fluid is heated. The fluid does not necessarily boil. The heated or vaporized fluid exits the boiler for use in various processes or heating applications. At Charter Oak Mechanical we specialize in all boiler installation, boiler repair, and boiler maintenance. Having a residential or commercial heating failure often becomes an emergency situation. Our professional technicians can repair your boiler quickly and efficiently to get you up and running smoothly again. We service all makes and models, and all styles of boilers as well. From stem boilers to radiant heating and all furnace work as well. 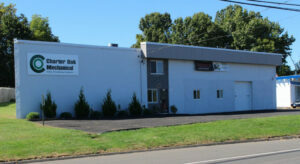 Charter Oak Mechanical is Hartford Counties heating repair and heating replacement specialist. When it comes time to replace your boiler, Charter Oak Mechanical carries the best boilers on the market. Balsham Boilers, Buderus Boilers, Weil- Mclain, Utica Boilers, and Triangletube just to name a few. For more information call the experts at Charter Oak Mechanical.